i am a little tipsy as i type this, so apologies if i mistype, though with my superior orthographic skills, it is highly unlikely. highly. the stuff i just drank is made by gods. these gods call themselves le trou du diable, their leader of the pack, andré trudel, and the elixir called la buteuse, the 2009 gold medal winner at mondial de la bière here in the royal mountain city. 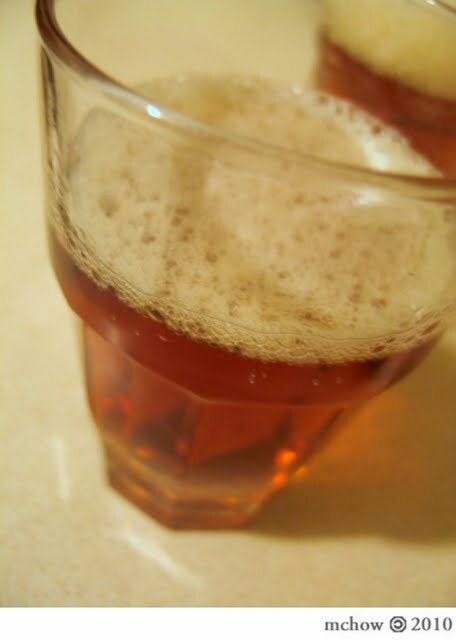 it's an amazing fragrant, strong, triple-fermented pale ale, complexly toasted-fruity-flavoured and strong (10%). it's strong.enough for sanitizing your toothbrush. too bad you can't find it anywhere because i think it's only been bottled three times in limited batches in the last 2 years (though my math might be bad). this one came in a 750ml bottle (at $20 a pop, it's definitely not a poor-man's king-can), but it would be such a delight to try it on tap at the brewery! 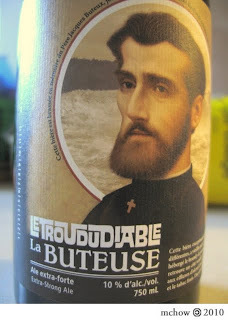 oh, and the weird priesty-man on the label doesn't freak me out like a real priest would... it's a nice label, in fact! and yes it is my birthday. or was. is. wasis. Happy Birfday ya' fancy-beer-swilling lush.